I was feeling ambitions the other day, and decided I might polish up my tutorial on Cellini spiral with some new step by step photographs. So I got the camera out, and snapped a few tutorial shots. Not one to waste precious Fireline, I decided to continue with the Cellini spiral, and create a bangle bracelet after my photographs were in the bag. Once the initial steps were complete, and the spiral was starting to take shape, I noticed something interesting about the tube in front of me. It looked like a ring. I’ve never been much of a fan of beaded rings, but something about the gradual curve of the blue 6o beads really caught my eye. I instantly pictured wearing something like it on a finger. After my Cellini bangle was complete, I set out to find a way to make a spiral peyote tube large enough to wear as a ring. I wanted to maintain the single row of 6o beads in the center, for it was these beads that created the jewel-like appearance that I wanted. I considered simply increasing the number of 10o’s, to create a wider tube, but I wanted a bit more flexibility if any shaping or tapering would be needed. I decided to add a second row of 10o’s, with 15o’s making up the center of the Cellini tube. 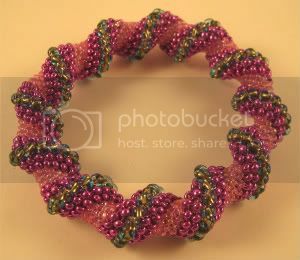 I was pretty frustrated by the fading of the purple galvanized beads in the bangle. They stood up to the wear from my hands, but flaked from constantly rubbing against the table as I stitched. My stash of 8o seed beads is pretty low at the moment, and my only option for matte beads were the Picasso green Toho’s leftover from my RAW necklace. To match the olive colored 8o’s, I chose 15o Toho's in Gold Lined Black Diamond, copper lined green 10o’s, and opaque black 6o’s. Once again, the combination is somewhat snake-like, but I love the subtle sparkle of the lined beads against the neutral opaque beads. I wouldn’t call this a failed attempt, exactly. I’m actually quite happy with the ring that I made. The only trouble is that it’s unlikely to fit anyone but me. As predicted, I ended up using the 15o beads to taper the tube and shape it to my finger. This means, of course, that it will fit only on the finger I was working with, and no other. This might be the first time I’ve ever made something just for myself. So it’s back to the drawing board, as far as Cellini rings go, but at least I got a nice bauble out of it! When I first became interested in jewelry design, I remember being really intimidated by the projects in Beadwork magazine. 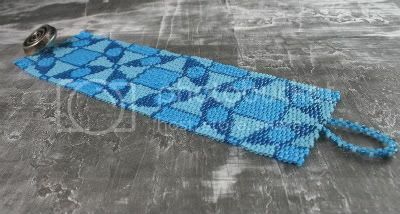 My attempts at peyote stitch were frightening, and tubular herringbone was a fabulous mystery yet to be explored. Today, Beadwork is one of my favorite sources for inspiration. My favorite feature is The Challenge, were the editors set out to create interesting beadwork from a pre-selected set of beads. Each design is unique, for each editor combines the challenge beads with their own stash, and their personal style. I love seeing the different styles of beadwork using the same set of beads. It’s a great way to explore the endless possibilities available to creative beaders. Recently, readers have been invited to participate in The Challenge as well, and the mystery beads for each issue are given to lucky beaders to create with as they will. Participants are drawn at random, and their finished work is featured along with the designs of the Beadwork editors. As much as I love The Challenge, I don’t yet have the courage to enter into the draw, and I feel like I’m missing out on a great opportunity for inspiration and creative growth. That’s why I was so thrilled to learn about the Use the Muse contest. Beadwork contributing editor, Scarlett Lanson, has created a beading challenge that anyone can sink their teeth into. The concept is very similar to Beadwork’s The Challenge, because the contest is open to designers of all tastes and skill levels. Here’s how it works: beaders can purchase a beading kit which includes all of the materials pictured above. Also in the package is a mystery component, called the Muse, which must be used for a design to qualify for the contest. Beaders can use any techniques or other materials that they choose, allowing for maximum creativity. Prizes are awarded in a variety of categories, including the overall grand prize - a fabulous treasure box filled with delicious beads. This is a really exciting opportunity to flex one’s creative muscles, to experiment with new materials, and to interact with other beaders. If you want to learn more about Use the Muse, and how to participate, visit Scarlett Lanson’s website The Beader’s Muse. Good luck to all Muse Users out there! If there were an award for the all time biggest bead lover, Lisa would be a serious contender. 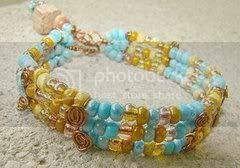 Her daily showcase of gorgeous, interesting and loveable beads on her blog, A Bead a Day, is truly inspiring. Lisa has been designing for nearly 20 years, and spent many years selling her work at craft shows. Nowadays, she’s using her talents in a more casual way, making jewelry for fun, family, and friends. 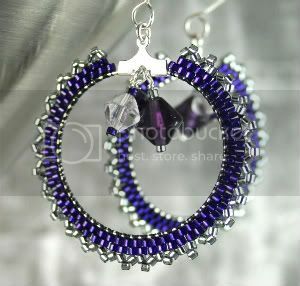 She’s also a beading instructor, teaching techniques ranging from beginner to advanced. Although she’s a veteran of beading, Lisa still enjoys learning new techniques, and brainstorming ideas with other beaders. She encourages other artists to participate in beading cruises, which have been a source of knowledge and inspiration for her. Inspirational Beading: When did you first know that you were in love with beads? Lisa: I sort of fell in and out of love with them for a few years after I started beading in 1990, but once I started working with memory wire around 1994, I seem to love them more and more every day and don't think I'll ever tire of them! IB: Do you have a favorite type of bead? 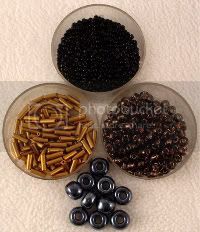 Lisa: I don't really have a favorite type of bead. I have a tendency to gravitate toward what I think of as "happy" beads - blues and yellows like the sky and ocean, and yes, smiley faces! However, I can find something special in just about every bead to love. IB: Where do you find the most inspiration? 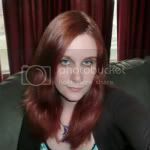 Lisa: When I feel a connection with nature or the universe I have a tendency to be more creative, but I can find inspiration in beads, fabrics, graphic art, flowers, etc. Brainstorming with other crafters and/or beaders also provides me with great inspiration. 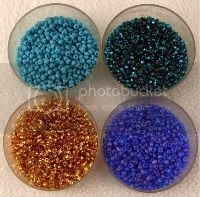 IB: What is your favorite bead color combination? Lisa: Variations of blues are the first that come to mind. Again, I think blue represents happy, peaceful, and content to me. IB: Who do you hope to inspire with your work? Lisa: I would like to inspire all other beaders to see the individual beauty in each bead and also in the wide variety of findings that are available. It's easy to get focused on the beads that are standouts such as crystals, but beads are works of art on their own in many cases. I love coming across other beaders’ work that gives me goose bumps. Just when you think you have seen it all, there's someone with a new technique and you get excited all over again! When that happens, I want to share what I have found with everyone I know and often write about it on my blog. It was a wonderful surprise to find such a great community of crafters online. Always encouraging and sharing ideas, it's wonderful! Lisa is currently working on her first beading book, which will be published by North Light Books later this year. 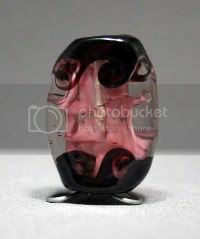 You can find daily inspiration on her blog, A Bead a Day, or catch up with her on Twitter and Facebook. The summer issue of Beadwork magazine has a wonderful collection of projects featuring jewelry inspired by patterned scrapbooking paper. What I love about the feature is the variety of designs used. Each artist started with a different piece of patterned paper, and came up with interesting and unique pieces to imitate the colors, textures and other aspects of the patterns. 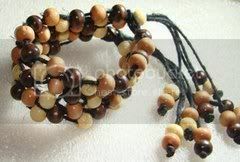 Although each designer used different techniques, such as stitching or wirework, and made different types of pieces, like bracelets and pendants, the connection between the finished beadwork and the original pattern is clear. My favorite piece is “Pixilated Peyote” by Melinda Barta. Beadwork is currently running a contest for readers’ pattern inspired work. Although it’s open to all types of pattern adaptations, I love the idea of using scrapbook paper for ideas. Even when the pattern itself isn’t imitated - as in “Moroccan Gate” by Danielle Fox - there are so many ways to turn these pretty papers into amazing beadwork. Even if you’re not ready to join in the Pattern Play Challenge, you can still find some instant inspiration from the wide range of scrap booking paper available to today’s crafters. Thanks to the web, we can seek out some fun, fancy or fantastic paper from the comfort of home. The next time you’re stuck for a color scheme, pattern, or shape idea, check out some of the scrapbook paper at sites such as Blackberry Paper, Scrapbook Lounge, and Stuff4Scrapbooking. I was suffering from a bit of beader’s block recently, and I decided to try and find a little inspiration by watching a movie. It had to be something with plenty of visual appeal, preferably artistic, and something that had the potential to translate into beadwork. Luckily, I have a pretty good collection of fantasy and sci-fi movies to choose from. I went over to the shelf, closed my eyes, and grabbed one at random. The film I chose was Constantine, a theological thriller based on the graphic novel Hellblazer. I have tried to find any mention of where these Asian lanterns originated. With no audio commentary to give me a hint, I was left with Google. Unfortunately, no one else seems to know whose painting or photograph it is. Although I wasn’t able to get a closer look at the artwork, I was still thrilled by the combination of pinks, reds and browns. Finding beads for this inspiration was fairly easy. 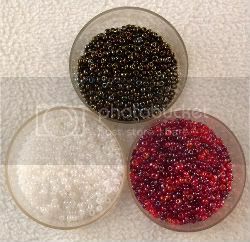 I just happened to have a really great transparent seed bead mixture of assorted reds, pinks and tangerines. Because of the shiny quality of the transparents, I went with a deep brown iris mix and white Ceylon seed beads to round out the palette. Although attempting to recreate the lanterns themselves would have been a fun challenge, it was really the colors in the image that caught my attention, so I wanted to do something really simple that would allow the red and brown to take center stage. A simple spiral rope - one of my all time favorite stitches - seemed fitting enough, and I used a pattern of lines with the red and brown beads. The white sits in the background of the spiral core. I picked up the red beads mostly at random, though I occasionally threw back some of the more orange beads to keep the necklace looking as much like the lanterns as possible. 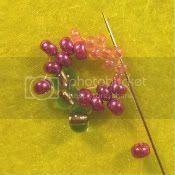 Most online bead shops offer newsletters filled with updates on sale prices, new stock and beading advice. It’s great to be the first to find out about a good deal on beads, but the pictures in the emails can be a source for inspiration, too. Whether it’s a new color combination, or just an interesting new art bead, store newsletters are often the start for great beadwork. Many shops also have some excellent tutorials and project ideas. Craft and beading websites like BeadStyle send out newsletters to members detailing upcoming issues and projects, editor blogs, forums posts and more. 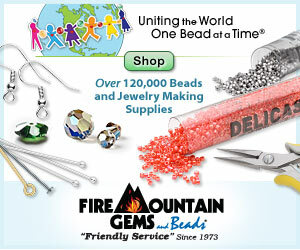 BeadingDaily members have access to tips on trends in beading and fashion, design advice and other inspirations. These and other newsletters can really help with that occasional, but inevitable, beader’s block. Most fashion magazines like Elle have websites filled with fashion news and trends. 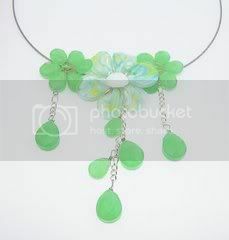 You can sign up for e-newsletters to get great ideas on jewelry styles, seasonal colors and more. These emails will keep you up-to-date on the latest fashions, and knowing exactly what kind of chic jewelry to make, so customers can match up with the in-demand clothing du jour. 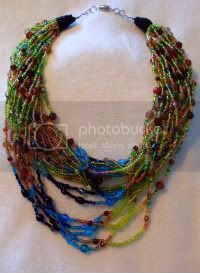 A few years ago, I was completely oblivious to the world of bead weaving and jewelry design. I had been a lifelong lover of beads, but most of my stash went into bead-strand tapestries that I used to decorate my apartment. I had been working on a tapestry that I hoped would look like a peacock feather when I picked up my first copy of Bead&Button magazine. I was instantly hooked, and my half finished art project sat under my coffee table for weeks, completely forgotten. After awhile I decided it was time to scrap it, or make use of it. I couldn’t bear the thought of using any of my beads to finish the project - that would take away from my new found love of jewelry making! 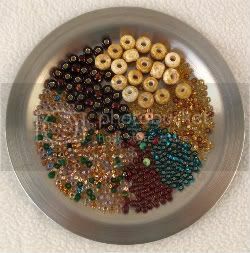 Even taking apart the already finished bead strands and separating them seemed too time consuming. 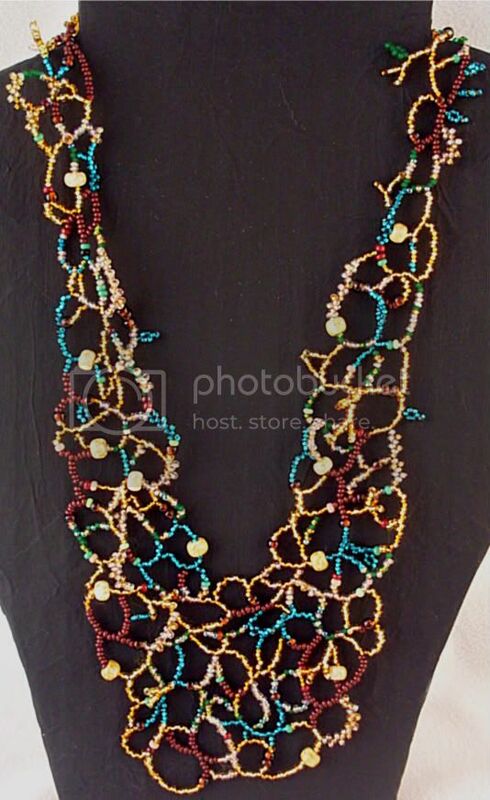 In the end, I decided to tie the ends of the threads together and make a multi-strand necklace. It turned out to be one of the best multi-strand necklaces I have ever made. Wherever a picture of this necklace goes, people stop to comment. It's been a great confidence booster over the years, and is one of my all-time favorite pieces. I recently gave the “Once a Peacock” necklace to a friend as a thank you gift, for helping me out when I really needed a hand up. It has been a great reminder of how to turn lemons into lemonade, and seemed like a great way to say "Thanks for saving my lemons!" But, since then, I’ve had peacock feathers on my mind. 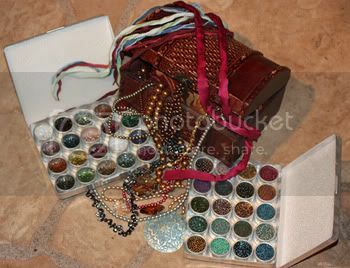 There seems to be a bit of a void in my finished jewelry stash that cries out for more blue-green-and-gold peacock eyes. This time I skipped the cobalt blue and went with a frosted indigo color, which pairs up nicely with forest green. 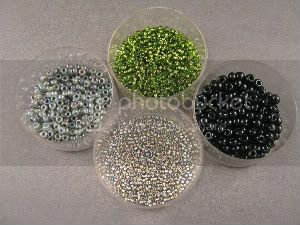 Also included in the seed beads was a brown foil-lined mix, opaque black, and opaque turquoise 10o’s. For accent beads, and embellishments, I chose matte gold bugles, gunmetal 3o’s, and gray copper-lined 6o’s. This time around, I went with a more abstract approach to the peacock feather. I wanted something that was long and luxurious, with a little body and a lot of fringe. To achieve the effect I wanted, I created four interconnecting St. Petersburg chains. 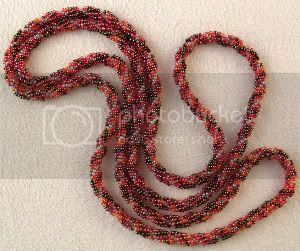 The pattern of the beadwork changes slightly at the point where each chain meets another, so only the centre of the lariat, which wraps around the neck, has large beads. The single chains at either end of the necklace have a more speckled look, because the gold and indigo beads alternate one at a time, instead of row by row. Each chain ends in a coral style fringe using the matte gold bugles, with green and indigo leaves like tiny peacock eyes. I was really happy with the results of this piece. Like many of my projects, there were a few moments when I thought my idea would not pan out. I’m glad that I stuck with it and saw it through to the end! How many times a day does the average beader think about creating their own unique beads to work with? For the self-taught beadweaver and lampworker behind Three Fates Design, it’s already a dream come true. Designer Victoria, of Southern Wisconsin, works as a research assistant and has a degree in biology from the University of Wisconsin. 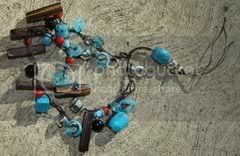 Outside the lab, she uses her love of beads to create interesting, one of a kind pieces. With a preference for beaded cuffs and a new found love of lampworking, this inspired beader shows us that we can work in multiple mediums for maximum creativity. Victoria: I was in high school. I lived in a house full of artists, everyone had some sort of artsy thing, except me. And trust me, I tried everything from painting, to sewing, to sculpting. My parents were always real supportive in helping me find my creative voice. Then one day my mom bought me a few beads and some string, and well, I was hooked. IB: Beadweaving or bead making? Do you have a preference? Victoria: This is such a hard question. I don’t think I really have a preference; I enjoy both of them so much. I love beadweaving a whole bunch, and have been doing it for so long, that I would never give it up. 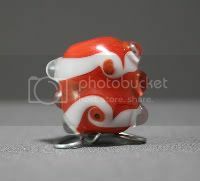 But lampworking is exciting and just as addictive as beadweaving. Maybe in a few years when I’ve worked with the glass a little bit more, I’ll have a different take. Who knows? Victoria: I seem to find inspiration everywhere. I really love nature; there are always beautiful color palates and fantastic shapes and patterns. And I love thumbing through fashion magazines. Some of that runway stuff is so colorful and crazy, how could you not be inspired. I also find inspiration at my “day job.” I work in a molecular genetics lab, so I see some really great patterns and shapes. I’m always looking for inspiration. IB: Do you have a favorite color to work with? Victoria: I would love to say green, because I probably own every shade of green bead and glass rod out there, but don’t ever seem to make anything with them. Maybe I’m saving them (all of them) for something special? The number one color I seem to be drawn to is blue. The majority of my work is in blue. I guess I secretly love blue. Victoria: I’ve never really thought about this. I guess I would like to inspire other beaders and designers. I’d like to show them that you should never give up. If one thing doesn’t work, then try something else. Who knows what you’ll learn about yourself. You can view the amazing selection of beaded bracelets, necklaces and earrings at Victoria’s shops on Etsy and 1000 Markets. The variety of beading techniques and design concepts in her collection is truly inspiring. To see some of her hot-off-the-press designs, check in with her blog Three Fates Design. Lately I have been working a lot with right angle weave, so I decided it was time to have a go at a little free form RAW. My previous attempts at free form stitching were not what I would call successful. With peyote and brick stitch, the bead weaving can get away from you, and the results aren’t always pretty. With RAW, there seems to be a lot more freedom. The wide spaces in the beadwork allow for quick stitching and easy embellishments. 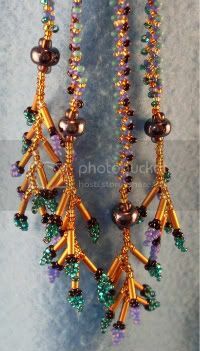 I followed the advice of NanC Meinhardt in the February-March issue of Beadwork magazine. Using the Izzy and Lucy Bracelet project as a guide, I set out to create an organic-looking necklace with a woodsy feel. I pictured something that a dryad would make while sitting beneath her tree on a warm spring afternoon. In keeping with the freeform idea, I threw together a mixture of bead leftovers and matched them with a few items from my stash. 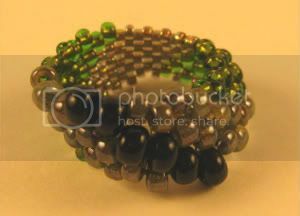 I selected some foil lined forest green and topaz, matte brown, and frosted green seed beads. I also added some crystal copper-lined seeds that I had culled from another bead mixture. For texture I included some brown foil-lined 6o’s and speckled 4o’s. After a rough start, I managed to find my groove and the necklace eventually took the shape I had envisioned. 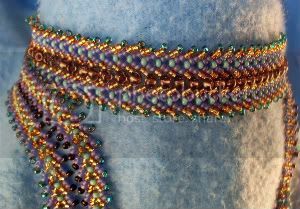 After adding many loops of randomly chosen seed beads, I added leaf fringe and peyote stitch here and there for texture. I’ll be the first to admit it’s not the prettiest thing I’ve ever made. But, for a first attempt, with a motley crew of beads, it turned out to be a great experiment.